There are many prepackaged items that are super simple to make and are healthier when homemade. A good example is Apple Cider Vinegar. It is easy to make, I can make it in small batches and use ingredients I have on hand. 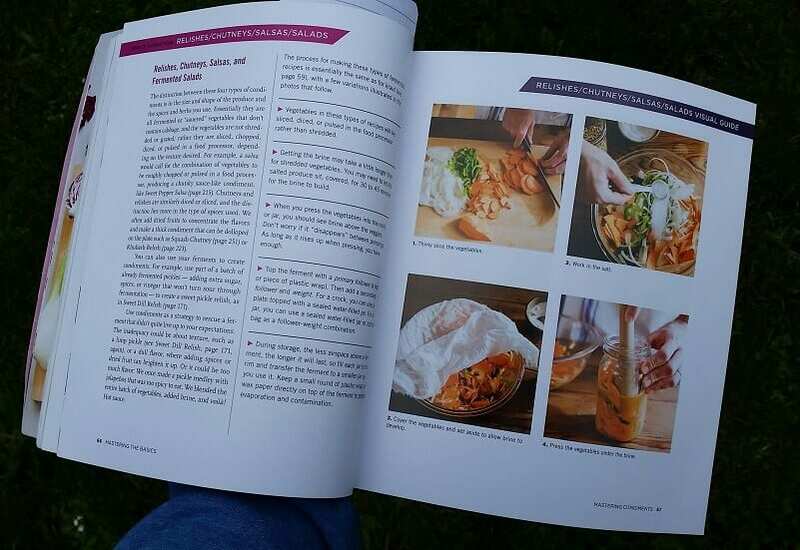 Small batch fermenting is a great way to make delicious and healthy food for you and your family. 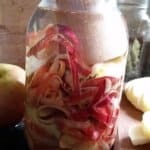 I have been canning for the last 4 years and just started small batch fermentation. Both canning and fermenting has opened my eyes to how many things are really quite simple to make in your own kitchen. 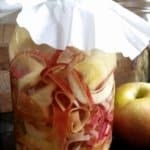 Foods such as jam, applesauce, pickles, apple cider vinegar, saurkraut, relish, tartar sauce… all are simple to make and don’t have to be done in large batches that would feed an army. 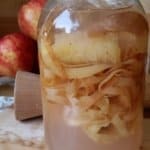 Why Make Homemade Apple Cider Vinegar? It is so easy, it tastes better, and it cheaper than buying organic, unfiltered store bought vinegars. NOTE: Unless you have a reliable way to test the acidity level of your homemade apple cider it should not be used for canning purposes. When canning with Vinegar you want a specific acidity level and that level in store bought vinegar is tested and regulated. 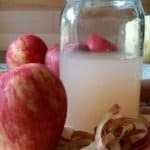 Homemade Apple Cider Vinegar is great for use in recipes and for drinking. It has amazing health benefits. Health benefits: First a note: I am not a doctor. I recommend before using Apple Cider Vinegar for health benefits you do your research (through credible medical sources) and you talk to your physician. There are a ton of claims as to what benefits you can get from drinking Apple Cider Vinegar. If you google “apple cider vinegar health benefits” You will find a lot of people out there talking about why it is fabulous. However, these are the two major claims I have found to be also backed by medical research. In fact, many fermented foods help with these. It can help regulate blood sugars. This is not a full solution but can help. Read HERE on WebMD to explore the topic and the cautions you need to consider. Can help with Digestion, heart health and overall gut health. We have personally seen this benefit for ourselves. You want unfiltered apple cider vinegar (like what you make at home) for this benefit. 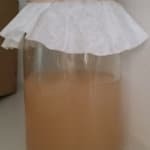 The cloudy “blob” in unfiltered apple cider vinegar is called “the mother” and it’s full of probiotics and other beneficial bacteria. Note: Don’t drink it at full strength. Dilute it so the acidity doesn’t harm your tooth enamel or esophagus. 1-2 Tablespoons a day is plenty. Perfect for small batch fermenting! Made out of Maple and hand-turned. Each tamper is unique and beautiful. With one end fitting in a regular mouth jar opening and the other fitting in a wide mouth jar opening they are the perfect tool for small batch fermenting. You can a batch in any size. If you are just starting with a quart you will end up with about 2 cups vinegar. 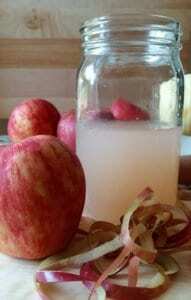 Make your own Apple Cider Vinegar in your pantry. 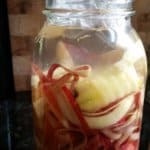 This simple ferment is full of beneficial probiotics. Super simple to make. 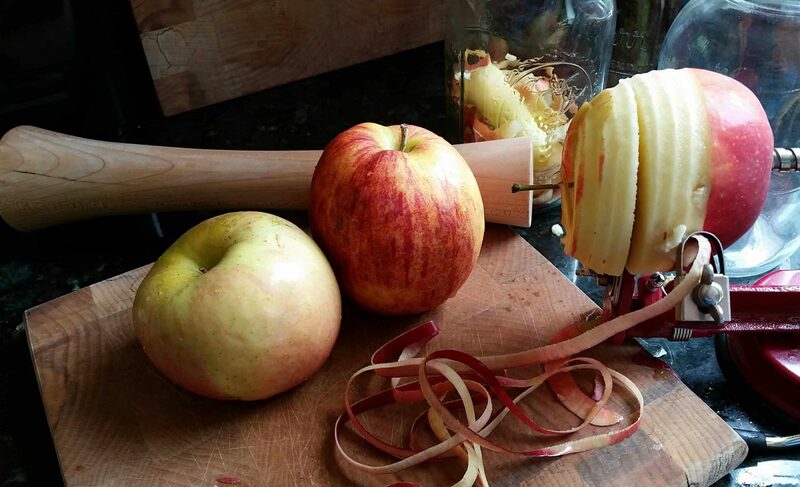 Fill your jar 3/4 of the way with apple peels and cores. Mix the sugar into the water until it’s mostly dissolved. Pour the sugar water over the apple pieces until they are completely covered. (Leave a few inches of room at the top of the jar.) Push apple pieces below the level of the water with a Vegetable Tamper. 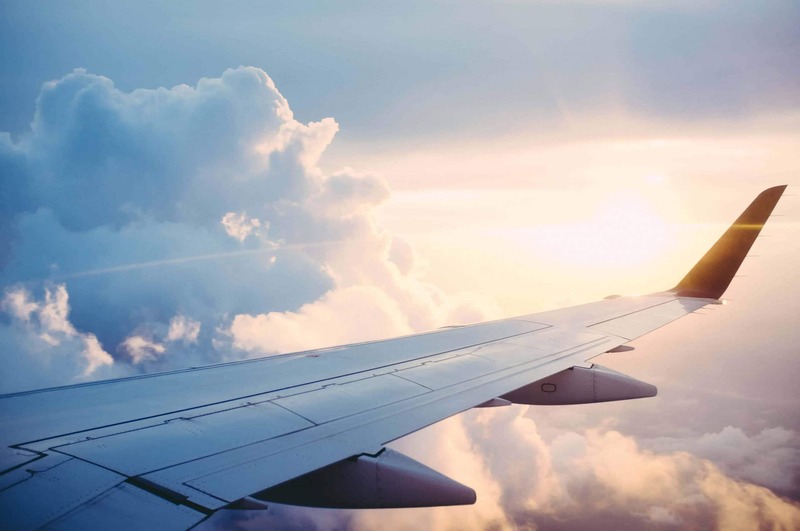 Keeping the weight in place, loosely cover with a coffee filter or breathable fabric, secure with rubber band and set in a warm, dark place for around two weeks. (I put mine in the pantry and label the jar with a date for reference) You can give it a stir every few days, if you like. Also, if any white scum develops on the top, that is normal and an indication that it is doing what it is suppose to be doing. Once two weeks has passed, strain the scraps from the liquid. You can discard the scraps into your compost or feed them to your chickens. Put that beautiful liquid back in the jar and place it back into your warm, dark place for 4-5 weeks. Time to now wait for that lovely vinegar tang to show up. After the first 4 weeks, you can begin to taste your vinegar. Once it reaches an acidity you like, you can transfer it to a bottle with a lid, refrigerate it and begin using it. 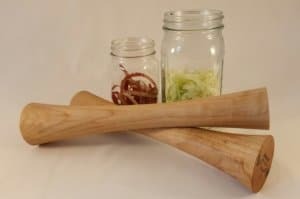 You can find our Vegetable Tamper at secure.ladyandthecarpenter.com. Perfect for small batch fermenting with one side fits perfectly in a regular mouth mason jar and the other side fits perfectly in a wide mouth jar. I use apple scraps after I prepare apples for the kids. The peels and core of about 4 apples fill a quart jar. 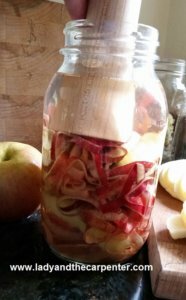 So, I use my apple corer/peeler/slicer to prep enough for all to eat (or make applesauce out of) then the scraps go into a jar and another ferment begins. I label my jars with a date so I know when different batches began. Apples are on the Dirty Dozen List for produce that has the highest level of pesticides present when tested. Therefore, Picking apples that are organically grown is an important consideration. If you are going to make something healthy for yourself it is a bit counter-productive to put pesticides in it. So, What is next in my small batch fermenting adventures…. Is One kind of Cutting Board REALLY better than another? There is a lot of talk out there about what kind of cutting board is best to use. 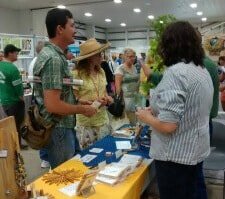 In fact, I get a lot of people asking me about the benefits of a wood cutting board when we sell them at fairs. I have heard every opinion out there and so I wanted to do my own research. Yes, I have my own experience, but I also have this tool called the internet that allows me to access research I would otherwise not have available. I really do try my best to make educated decisions based on some kind of research and I try to pick credible sources for that information. My references are all sited at the end, but here is the basics. As you see I currently have a variety of options. 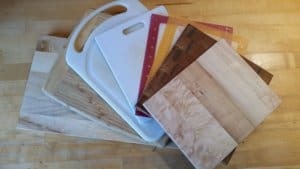 My favorite by far are my wood cutting boards but all have their own advantages. We will talk about those but after my research I think my cutting board selection will be changing some. 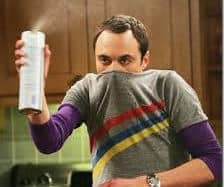 I am not a germaphobe. Granted, when my son was 2 and he licked a wall at the checkout stand from top to bottom I about freaked. 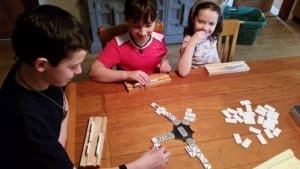 Then I shared the story with some Mom friends and mine was by far the tamest story and all of our kids were alive and well. There are germs and bacteria everywhere. The body doesn’t function well if all are eliminated. There is necessary and beneficial bacteria all around us. Reference.com states it simply (though you can find many reliable references for the same information) ” Though some bacterias cause disease and illness in humans, the majority are harmless. Some bacterias are used to aid digestion, used in preparation of certain foods, used to battle infections or used by industry.” I mean who doesn’t love cheese and sausage? Right? Granted, I still get the hebbie geebbies when I am shown microscopic pictures of them in my water and on my body and have a temporary urge to scrub everything with bleach… but science tells us to relax and take a deep breath. Are our cutting boards harboring bacteria in a way that is harmful for our families? What can we do to reduce that risk? And does the type of cutting board we use make a difference? Below the pros and cons I have referenced my resources so if you want to follow through with the same research yourself you can. I found the best resource to be this article to be this research by Dean O. Cliver, Ph.D. I feel no need to restate all of their facts, but here are the pros and cons I have found for each with a little detail. 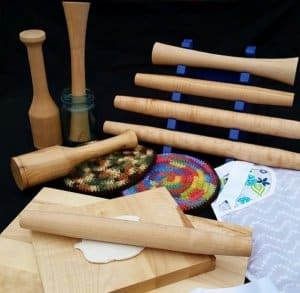 What Cutting Board Material is Best?